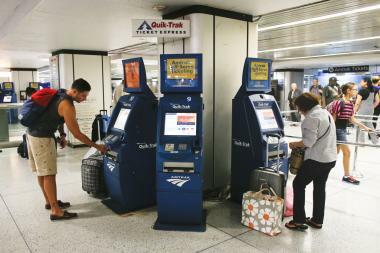 Travelers picked up their train tickets at Penn Station on July 2, 2013. MIDTOWN — Tracks at Penn Station could reportedly be closed for 44 days this summer as Amtrak carries out infrastructure repairs at the aging transit hub. A preliminary plan devised in response to recent delays and derailments at the station involves closing "at least two tracks at a time" between July 7 and July 25 and Aug. 4 and Aug. 28, reports said. NJ Transit and Long Island Rail Road officials are “currently reviewing the initial plan and developing individual service plans,” an Amtrak spokesman said Wednesday. At a New Jersey Legislature hearing last week, NJ Transit’s executive director Steven Santoro expressed concerns that the plan could cut the number of NJ Transit trains running during morning rush hour in half, the New York Post reported. The planned outages could also affect LIRR trains, an Amtrak spokeswoman confirmed last week. Amtrak, NJ Transit and LIRR plan to “jointly communicate” information about service disruptions “once a unified approach has been agreed to, potentially next week,” the spokesman said Wednesday.